Newsroom - Cleared for takeoff: A cadet’s path to the flight deck and the women who paved it - American Airlines Group, Inc.
Brystal Duppstadt is among the first prospective pilots accepted into the first-of-its-kind American Airlines Cadet Academy. 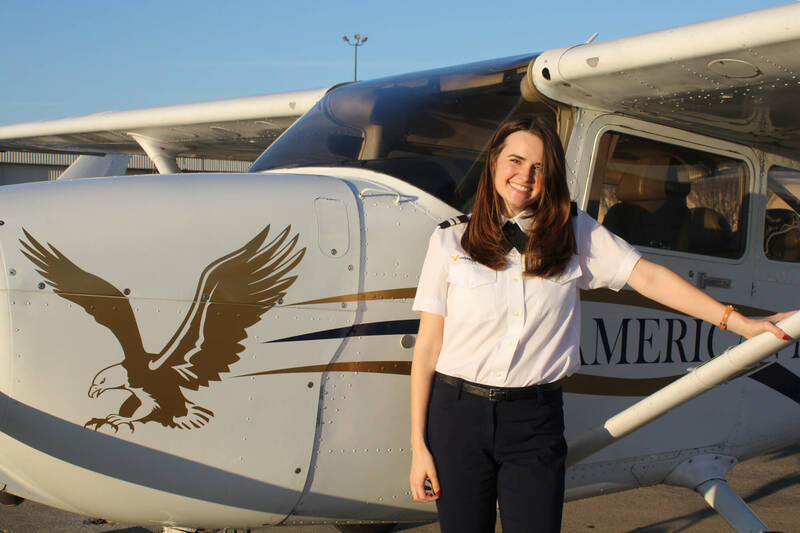 She’s on pace to become the first woman to complete the instruction phase of the academy and begin the process of building flight hours toward her Airline Transport Pilot Certificate. And, she’s the first person in her aviation family with a clear path to becoming a commercial airline pilot. But the Euless, Texas, native would tell you she’s just like anyone else with a dream of flying. She would start to learn that lesson as her own challenges came into focus. Her mom had tried to become a pilot, but other responsibilities got in the way. Would they for her too? The cost of building flight time wasn’t something she could incur. But even if she could, where would she start? Brystal earned a degree in mechanical engineering, but she could never shake that nagging feeling of wanting to be behind the controls. Halfway through college, her mom mentioned to a coworker — a female captain at her airline — how hard it was to figure out the first step. “It turns out, the conversation was the first step.” Brystal said. That captain connected Brystal with Jennifer Olson, a Dallas Fort Worth (DFW)-based First Officer at American. Together, those women helped Brystal find a flight school, buy books and pay for her discovery flight. Jennifer also became her mentor, offering advice on how to build a career in the flight deck and introducing her to coworkers. One of them was Chris Broom, Managing Director of Flight and Training Administration for American. That program, the Cadet Academy, offers aspiring pilots the training, mentoring and support necessary to one day fly for the world’s largest airline, along with a guaranteed interview at one of its regional carriers and a defined career track to the mainline. As Brystal prepared to apply, small airports became her second home, including one in the city of Justin, a community of about 3,000 people nestled about half an hour north of Fort Worth, Texas. She didn’t need another sign that this path was the right one. But she got one anyway. Unbeknownst to her, she was chatting with an American Airlines captain who had played a role in academy’s development. And, he had seen her before — in a photo that she had taken while inside a simulator during her tour. Fast forward to today, and Brystal is readying for the experience phase of her training as a diverse new pool of cadets begins the instruction phase. Jennifer continues to be Brystal’s mentor as she builds hours. Brystal’s mom is behind her too … being a mom. And, with the benefit of her own experience, Brystal has some advice, too.